Christmas is one of the most festive and looks forward holidays in the Philippines. As a Christian nation of which majority are Catholics, the country celebrates Christmas every 25th day of December in the Gregorian calendar in commemoration of the birth of Jesus Christ. 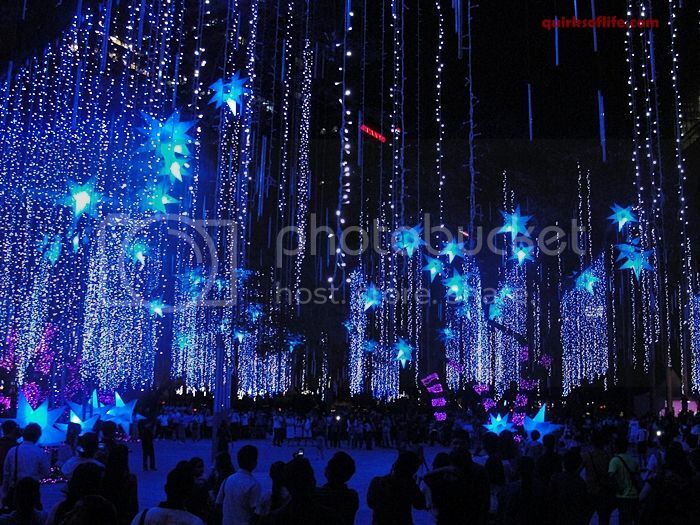 It has been said that the Philippines has the world’s longest Christmas season celebration. Most probably this is true because as early as September you can already hear Christmas songs played in the airwaves and in shopping malls. This will last until the Feast of Three Kings on the first Sunday of January. A few days before December 25, many companies especially those catering to manufacturing businesses give their employees Christmas break (few days vacation). Hence, most of the workers go home to their provinces to celebrate Christmas with their families. Christmas in the Philippines is synonymous with parties. Christmas get-together abound in almost all areas of the archipelago: in school, offices, and communities and within clans. Schools oftentimes held their parties the last day before the school holidays while offices and clans have their Christmas bash few days before Christmas. Activities during Christmas parties include singing, dancing, parlor games, and eating with foods and drinks that are pooled together (pot luck). Along with the parties, gift-giving, exchanging gifts or Monito-Monita (Kris Kringle) is usually done which contributed to the merriment of the group bonding. The different themes of the Monito-Monita gift-giving such as something soft, colorful, or round and other unique ideas infuse more excitement and gaiety to the celebration. View here for more of Monito-Monita themes for gift giving. 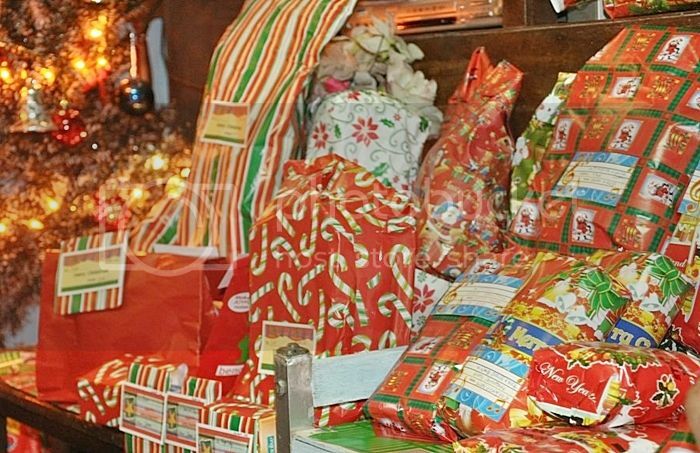 Within the family, giving of Christmas presents is done during Christmas Eve after attending the midnight mass and eating of a sumptuous Noche Buena. The Simbanggabi (Night Mass) is one of the most important Filipino Christmas traditions. It represents the strong devotion of the Filipinos in remembering the birth of Christ. Simbanggabi is also known as Misa de Gallo or Rooster mass because the masses oftentimes begin just before the rooster crows. Celebrated as early as four o’clock in the morning, this is a novena-like mass held for nine days starting December 16 until December 24. 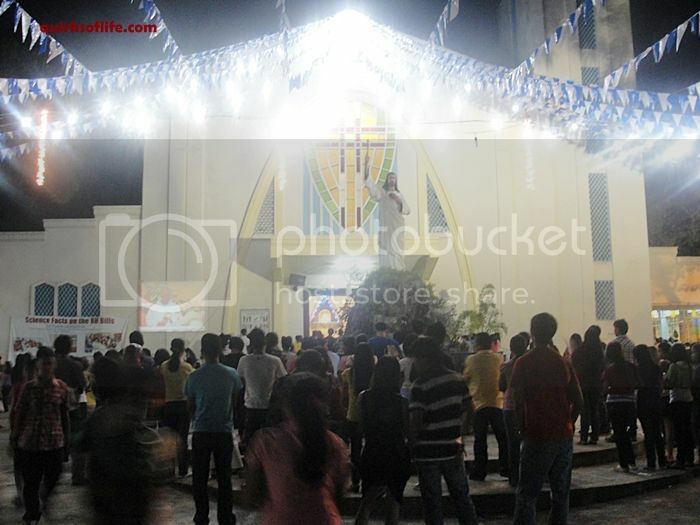 Usually, numerous devotees attend the Simbanggabi that they can no longer be accommodated inside the church just like the picture below. The Simbanggabi has its origin in the Philippines’ Spanish colonial history when the priests would visit the farms in the early hours of the morning to say mass to the farmers who cannot leave their farm lands to hear mass in the churches. After Simbanggabi, families dropped by the stalls located outside the church to partake in the delicious Filipino Christmas native treats sold by vendors. Commonly sold Filipino delicacies are bibingka (rice cake made with rice flour, egg and coconut milk), puto bumbong (purple rice cakes made from glutinous rice or malagkit with freshly grated coconut meat), tsokolate (the Filipino version of hot chocolate) and salabat (hot ginger tea). The Panunuluyan, another Filipino Christmas tradition, is commonly done in schools and in the provinces. Usually held on Christmas Eve, the Panunuluyan is a re-enactment of the event that happened more than 2,000 years ago depicting the search of Saint Joseph and the Virgin Mary for a lodging place in Bethlehem. Students and local town folks garb in costumes of shepherds and innkeepers participate in the portrayal wherein Saint Joseph and Virgin Mary were cruelly refused shelter many times. Eventually, Saint Joseph and Virgin Mary find their way to the parish church. Here, a replica of the stable is waiting for the Holy Family. This is followed by jubilation of the shepherd actors due to Jesus birth and the celebration of the Christmas Eve mass. The Panunuluyan is modeled after the Spanish Las Posadas. Onother tradition that most Filipinos celebrate is the Noche Buena. After attending the late evening mass on Christmas Eve, family members get together for the midnight meal, the “Noche Buena”. The typical Filipino noche buena meal consists of a main course of: lechon, fried chicken, adobo, barbecue, pancit, lumpia and desserts like cakes, ice cream, rice cakes, and pastries. Many families open the Christmas presents after eating while some waits until Christmas Day. There may be storytelling, dancing and singing that may last until four o’clock in the morning on Christmas Day. The Noche Buena is like an open house feast; there is an abundance of foods and drinks. Relatives and friends who drop to wish “Maligayang Pasko” (Merry Christmas) are invited to partake of the foods prepared by the host family. The Christmas Eve get-together usually becomes a reunion of immediate and distant family members. In the Philippines, Christmas Day is mainly a family affair. Filipino families gather together on December 25 for a grand feast of delicious Filipino fares. Before partaking of the Christmas Lunch, young children pay respects to the elders in the family by “Pagmamano” (asking the hands of the elders and touching it to the forehead) while saying “Mano po”. The elders then bless the person giving the respect followed by giving “Aguinaldo” (crisp money bills) to the younger children. Some families prefer to open their Christmas presents after the sumptuous lunch. While several family members may choose to return to their homes to rest, others stay until night time to have dinner together. Traditionally, on Christmas Day, children visit their godparents to request for their blessings. In return, these godparents give gifts to their godchildren. Caroling is one of the activities commonly done during the Christmas season. While some carolers visit houses and sing Christmas songs as a tradition of giving joy through singing, other groups do it to raise funds for the needy and less fortunate families. Groups of kids going from one house to the next house chanting Christmas songs are a familiar sight in the neighborhood. Using makeshift musical instruments like bamboos, tin cans and tambourines made with aluminum bottle caps (tansans) put together on a piece of wire, these kids chant “Namamasko po” after rendering a Christmas song. They are expecting that the homeowner will reward them for their singing. After receiving something, they sing “Thank you, thank you,” ang babait ninyo” (you are so kind), thank you! The New Year’s Eve on December 31 is celebrated by Filipinos with a family gathering for the much-awaited “Media Noche”. The midnight meal is oftentimes a feast of festive foods representing hope for a good fortune and prosperity in the coming New Year. At the stroke of 12 midnight, the New Year is met with the banging of pots, blowing of horns and lighting of firecrackers aimed to drive away the vicious spirits. Other Filipino customs in welcoming the New Year include displaying of round fruits and wearing of clothes with circular and dotted prints which symbolizes money and economic prosperity throughout the New Year, opening of windows and doors to let the good luck inside the homes, and the eating of the prepared twelve fruits at midnight for good fortune in all twelve months of the coming year. These are beautifully shaped Christmas lanterns displayed in almost all Filipino homes and buildings. Although these Christmas symbols come in varying shapes and sizes, the star-shaped ones predominates. Ranging from simple lanterns made up of bamboo sticks and Japanese paper or cellophane, to more expensive commercially produced items, these colorful Christmas decors contribute to the festive atmosphere of Christmas. 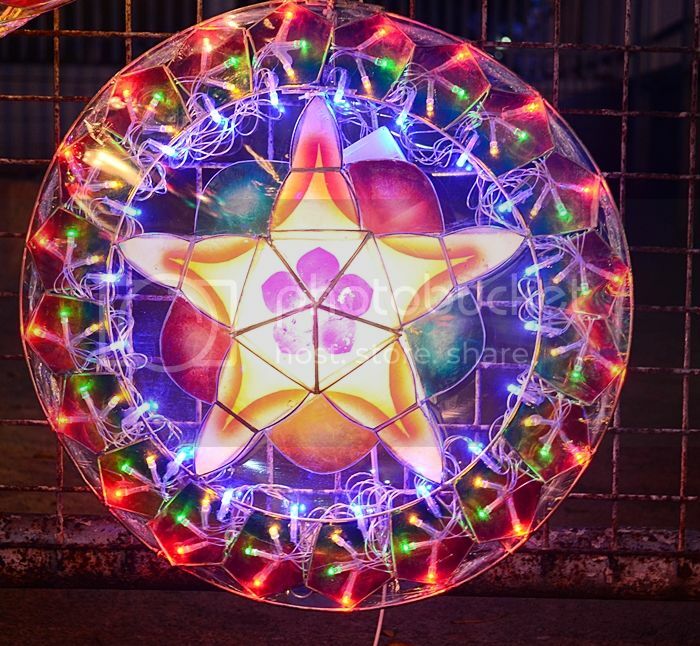 During previous decades, the parol is used by people in the barrios to lighten their path in going to the church to attend the Misa de Gallo since at those times many rural areas do not have electricity yet. The Parols serve as a symbol of the shining “Star of Bethlehem” that guided the Three Kings (the Magi) to the nativity site of Jesus Christ. Also, the Parol represents hope and goodwill for the Filipinos. The Belen which is a traditional Filipino Christmas symbol is a portrayal of the Nativity Scene of the baby Jesus in the manger with the Virgin Mary and Saint Joseph, surrounded by the three Magi, the angels and the shepherds and their flock of farm animals. Customarily, Belens are set up in churches and living rooms of Filipino homes. 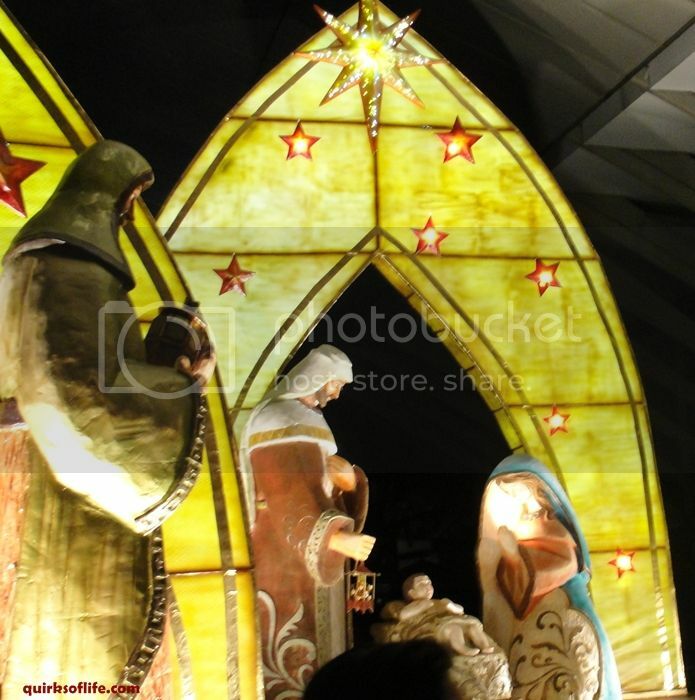 However, nowadays, malls and business establishments have displays of Belen in their offices. The origin of displaying Christmas Trees came from Germany. It was recorded in 1521 that the first evergreen tree was used and decorated for Christmas without lights in the German Region of Alsace. 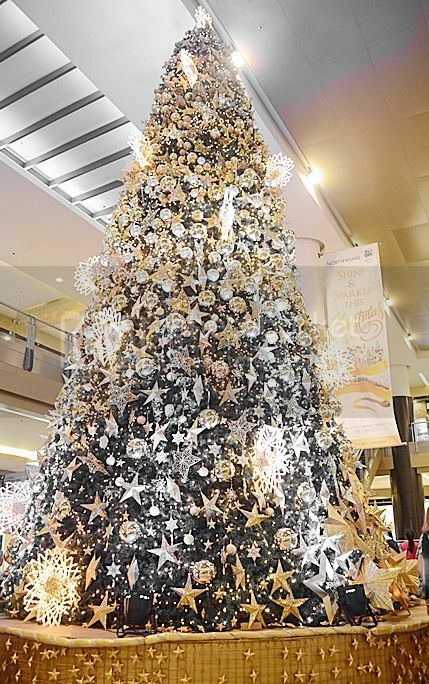 Somehow, the Filipinos have adopted this custom of displaying Christmas trees in their homes during the Christmas season, making it a part of the Filipino Christmas tradition. Spectacular displays of Christmas lights add to the gleeful ambiance of the Christmas celebration! The Filipino Christmas celebration can be a mixture of native Filipino traditions and western influence, yet the warm- hearted Filipino traits, close family ties, true faith and devotion make the Christmas festivity incomparable. Christmas may mean food, gifts, time-off from work and fun moments shared with family and friends, yet, we should not forget the true essence of Christmas: the celebration of the birth of Jesus Christ! Merry Christmas everyone! Malipayong Pasko! Like and follow quirksoflife.com in facebook!